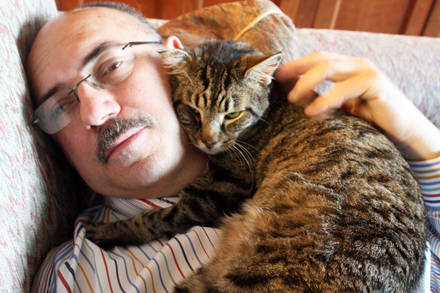 We wanted a sociable and friendly cat. We also didn’t want another white cat like Lily that would remind us much too much of her. So Kris matched us with Brandon. When we first met him Warren sat on the floor cross-legged to pat him, and he immediately walked up and sat on Warren’s lap as if on queue. That was all it took for us to make our decision. Brandon was delivered to us a few days later after a complete medical examination. 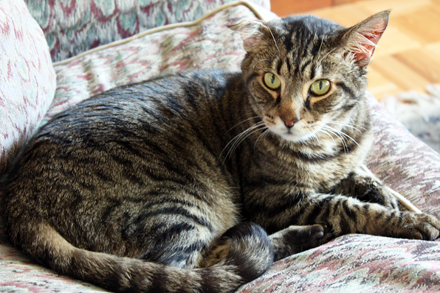 He felt comfortable in his new home and adjusted to it immediately. But we were tentative about his name. Since he was not answering to Brandon anyway we decided to give him a new name. Xiao Hu (小虎) sprang to mind almost immediately. The name means “little tiger” in Mandarin, and since he has black and gray tiger stripes we thought it very appropriate. 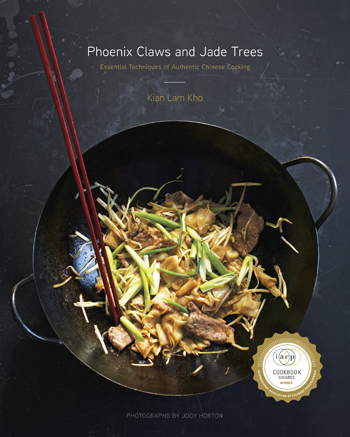 With Xiao Hu now part of our family I wanted to create a cookie recipe for Christmas in his honor. And while I was at it I also decided to enter this Christmas cookie recipe in the Bon Appétit Blog Envy Bake-Off as well. 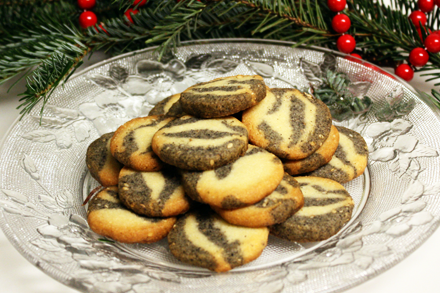 This is a recipe for tiger striped cookies and I’m calling them Christmas Tiger Cookies. So vote for the recipe at the Bon Appétit site! My Christmas Tiger Cookies are made from two flavors of cookie dough, black sesame and almond, which share a common base. I like the combination since the two flavors compliment each other. Besides, the black and yellow stripes create a beautiful tiger fur design on the cookies. However, if you are a purist, you can also make separate batches of sesame or almond cookies from each type of dough. Each individual flavor can easily stand up on its own. Xiao Hu loves to watch me cook and sat on the kitchen counter while I developed this recipe. He alternately balled up on my recipe notes when I measured the ingredients, or sat bolt upright when I turned on the Kitchenaid. It is a very pleasant surprise for me to gain not just a new member in the family but a new comrade in the kitchen as well. So help us welcome our little tiger and oh, I assure you no cat hair got into my cookie dough. Sift the flour with the baking soda and salt in a bowl and set aside. Cream the butter and sugar in an electric mixer fitted with flat beater until well blended. Add egg and continue to blend. Then add the flour mixture and blend until the dough is smooth. At this point the dough will be moist but not sticky. Divide the dough equally into two portions. Use a scale to make sure they are evenly divided. Blend the almond flour and extract into one half of the common dough then set aside. 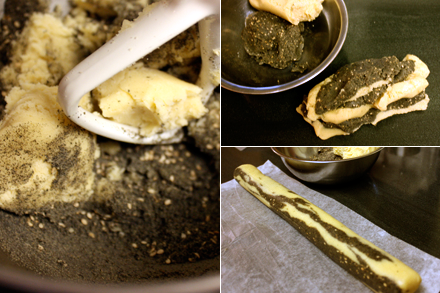 Blend the black sesame powder and white sesame seeds into the other half of the common dough and set aside. If you blend them in the above order you need not clean the bowl since the black sesame powder will not discolor the almond dough. Divide each flavored type of dough in half again. Then alternately layer the almond and black sesame dough to form a long irregular rectangular block. I use three layers each of the two flavors of dough. Shape the dough into a long cylinder of about 1.5 inches in diameter and roll up in parchment paper. Repeat the process with the rest of the dough. Refrigerate the cookie dough cylinders for at least four hours before cutting. You can get black sesame powder in Chinatown markets. Alternatively, lightly toast a cup of black sesame seeds in a frying pan on moderate heat for about two minutes, and then blend the seeds in a blender until completely pulverized. You can buy ready made almond flour in the market or make it by pulverizing blanched white almonds in a blender. Preheat the oven to 375 degrees F. When you are ready to bake the cookies simply unroll the parchment paper from the dough and slice the dough into rounds about 1/8 inch thick. Place the round dough on baking sheets and bake for about 8 minutes or until the edges just beginning to turn brown. Cool the cookies and store in airtight jars until ready to serve. Enjoy! He’s a beauty, and I think the name is far more appropriate. After reading T.S. Eliot’s book, I no longer think that you can just give a cat any old name. Their names need to be earned. Long ago, a friend of mine brought home a rescue cat that hid under the bed right away. When I came over, I got down on my knees, peered under the bed and said “Well hi there! What’s your name?” As my friend was trying to tell me that the cat was named ‘George’, the cat looked right at me and said “Burtleburt” I responded to him, calling him Burtleburt and he came out from under the bed. It was pretty clear that he hated being called George. I love your cookies and how it fits right into this post. So appropriate! WOW!!! Is this for Santa or for mommy to eat all up!? I love rescue kitties. They are wonderful family additions. He looks so happy on Warren and he keeps you company in the kitchen, too? What a great fit for your family! Voting for his cookies now! That’s a beautiful cat. Happy holidays to you and Warren, from Walt and Ken (friends of Harriet). Hi Ken, Thanks for visiting Red Cook. Harriet has invited us to visit her in France but we have yet to make happen. So glad to meet you virtually. We’ll have to really plan a trip soon. I’d be in heaven exploring the wonderful food in the Loire Valley. 2010 Year of the Tiger! Hes beautiful..I am going to make your cookies for a cookie exchange. That’s one special cat to be honored with such a beautiful cookie. I totally love sesame seeds in anything, too. I bet these are an awesome way to showcase their distinctive flavor. Happy holidays! I can’t imagine that there are very many cookies made in honor of a cat. Your creation looks wonderful. hi, i love your cat and this tiger cookies, just made them but replaced almond with millet because of my daughter’s nut allergy. They are sooooo yummy and crisp, almost impossible to stop eating them. What a sweet picture of Warren and Xiao Hu. I’m very excited about this dark dough that does not have chocolate in it. I may use this idea for another recipe. These look great! I hope it’s not too late to vote for your cookie recipe. PS. I can hear her purring.